the nytpicker: Want Some Fast Cash? Bet On Frank Bruni's Star Ratings With Handy Eater.com Guide! Want Some Fast Cash? Bet On Frank Bruni's Star Ratings With Handy Eater.com Guide! To those who wonder whether Frank Bruni's restaurant reviews are getting predictable, the answer is a resounding yes. To those who wonder whether that's a problem, the answer is a resounding no. Since 2006, a popular New York City food website, Eater.com, has published a weekly Tuesday afternoon feature it calls "BruniBetting." After gleaning from the Times website the restaurant Bruni will be reviewing the next day, Eater then prepares a betting summary that offers odds on every permutation of star rating, along with its reasoning -- often an intelligent assessment of the restaurant's chances, based on past Bruni columns. The result: in 2008, Eater has predicted Bruni's star rating correctly in 31 out of 50 reviews, for a stunning .620 batting average. And in nine other instances, Eater went against its own odds assessment and predicted an "upset." Had the website stayed faithful to its own oddsmaking, it would have gotten another nine correct -- meaning that it accurately predicted Bruni's star choice in 80 percent of his 2008 reviews. What's the significance of this? Well, for one thing, it means the most important restaurant critic in New York rarely veers very far from the collective opinions of the public, of restaurant insiders, and of other critics — all of which Eater apparently takes into account when doing its BruniBetting. And on the restaurants where Eater predicts incorrectly, it's usually because Bruni is usually more generous. For example, of the 11 restaurants for which Eater failed to accurately predict either a two- or three-star ranking, it was usually because Bruni gave an additional star (in eight instances) as opposed to giving one less (in three). Another point to consider: even better than its numerical prowess, Eater has proven itself skilled at predicting the content of Bruni's review. It almost always correctly guesses his spin/focus, if not the exact details. In the spirit of full disclosure this week, we have the inside track on Secession: turns out it's terrible. And even if that doesn't play, it should be noted that the critics, save for an off-her-game RG and a non-anon Cuozzo, hated the place. The Platt dropped a goose egg on it, for example. What's more, the food blogger set, usually chomping at the bit to fellate a guy like Bouley on a new venture, haven't exactly rallied behind the place. As it relates to Frankie Boom Boom, the clumsy nature of the makeover and a scatter-shot menu at prices greater than bargain basement are going to leave a mark. The only dilemma bettors face this week is between one and zero stars. It's true that Brunz hasn't been shy with the goose bags of late, and if he's shown us anything in the last several weeks, it's that value plays in this economy. On the other hand, it's David Bouley, who's going to be given the benefit of the doubt if at all possible. Go time: while one star is the low risk sweet spot, we like 5-1 on a big fat nada. Look for a good show either way, for this is a very serious chef far far from his best. Going against its own odds chart as usual, Eater came away with another winner: Bouley delivered the golden goose egg. And, just as Eater predicted, he went after the clumsy makeover and scattershot menu. "Some bath towels aren’t as big or floppy," Bruni said of the menu. What's appealing about the Eater feature is that it takes Bruni seriously, as he deserves, and doesn't ridicule him for being easy to read. The truth is that Bruni is the best restaurant critic the Times has had since Ruth Reichl (if you take that as a slight against the one critic in between, William "Biff" Grimes, you would be correct), and perhaps the funniest food critic in the newspaper's history. After four-plus years on the job, Bruni still writes with the same passion and wit that he brought to the task when he left his reporting post as Rome bureau chief to take over the beat. Rumors of Bruni's departure have been roiling the Internet for months; let's hope they're not true. Getting rid of Bruni would represent a classic Times blunder. The fact that Bruni's star ratings can be deconstructed so easily suggests, among other things, a consistency of vision that adds value to his voice. He knows what he wants from a restaurant, and it's a reasonable request: good food, pleasant ambiance, good service. He loves innovation and loathes pretension. He respects visionaries like Bouley but holds them to a higher standard. Okay, so he likes steak too much -- but it's his health on the line, not ours. 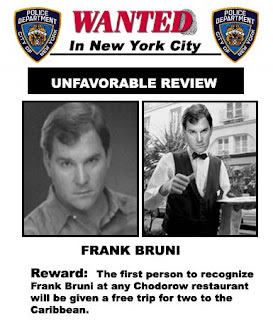 Unlike star-happy hooligans like his predecessor Bryan Miller -- who launched Bouley's ego into hyperspace with a three-star review at Montrachet, and four stars at Bouley -- Bruni has been cautious with his rankings. No one has gotten a four-star review in 2008, and no likely candidates appear on the horizon. He has awarded zero stars five times, one star 20 times, two stars 15 times, and three stars 11 times. That sounds right. We give it a 3-1 shot that he keeps the job for at least another year.